Check the amount of window washer fluid by looking at the reservoir. If the washer fluid is low, the washer level indicator* appears on the instrument panel or a message appears on the driver information interface*. 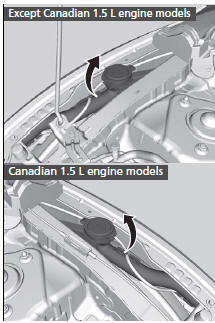 NOTICE Do not use engine antifreeze or a vinegar/water solution in the windshield washer reservoir.